Today is our last day in Broken Hill, and it has been a very interesting and informative visit. So we decided to go for a drive to the Menindee Lakes, about an hour east of Broken Hill. 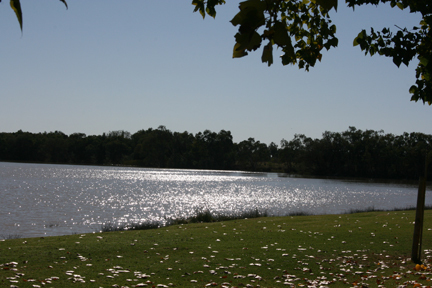 The township of Menindee is the oldest European settlement in western New South Wales, and the first town to be established on the Darling River. This is also the birthplace of the mighty Darling River. The first European to visit the area was the surveyor and explorer Major Thomas Mitchell in 1835. The Burke and Wills expedition camped at Menindee on their journey to cross Australia from Melbourne to the Gulf of Carpentaria. 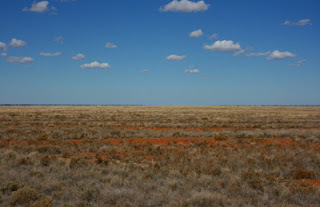 They arrived here on 14 October 1860, crossed the Darling River at Kinchega Station and set up their thirty-fourth camp since leaving Melbourne. There was dissent within the party and the deputy-leader George Landells resigned. Robert O'Hara Burke split the party, heading north to Cooper Creek with half the men, stores and animals. The remaining men, stores and animals made a depot camp at Pamamaroo Creek and a sign and cairn now mark the site of the camp. This camp was used for the remainder of 1860 and for most of 1861. While in Menindee, Burke stayed at the Maiden's Hotel, which was then owned by Thomas Pain and was known as Pain's Hotel. The Maidens Hotel is still in operation to this day. 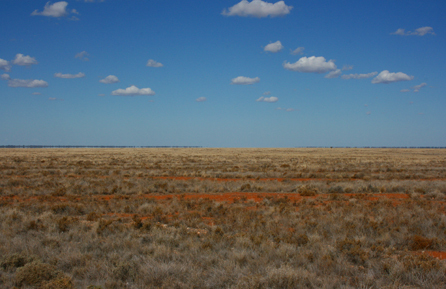 The countryside between Broken Hill and Menindee is definitely the most barren I have ever been in. It is hard to imagine how hard it was for the early explorers such as Burke and Wills to even get from Melbourne to here. Shake, Rattle and Roll on this dirt Road!! Wow, the beauty of your country astounds me! 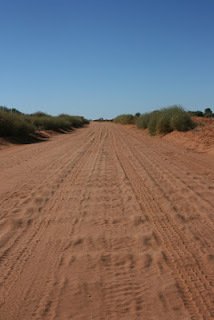 The red roads remind me of my trip out into the APY Lands... I so want to come back to visit again! Enjoy your day my friend and happy trails to you! Loving the blend of travelogue, history and geography lessons. I have always admired the fortitude of the early explorers and settlers. Can you just imagine the drive and determination they must have had? Glad they did though! Great photos Davine.